A LOOK AT SOME of the ITEMS IN OUR 2015 LIVE AUCTION! 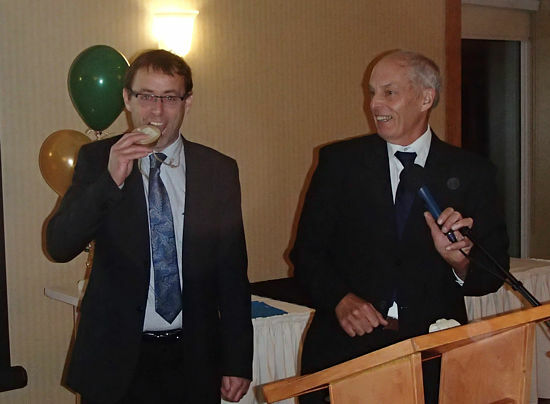 We are very pleased to announce that our 13th GDA, held on Oct 30 at the Atlantica Hotel, Oak Island, was another sellout and an another outstanding success. The evening will net MICA well over $70,000. These funds will be used to support MICA's island and property acquisition initiatives, for conservation and for traditional public use. GDA Co Chair Georg Ernst, Ward Isnor, GDA Co Chair Brom Hart, Sherrill Harrison, Bryan Palfreyman. 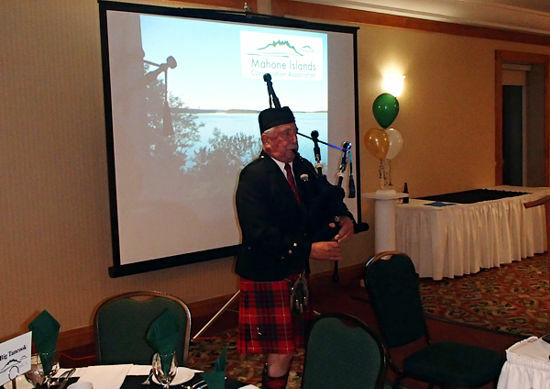 Dr. Laurie McNeill very expertly entertained guests with some very nice music before Bagpiper Denis Stairs officially opened the 2015 GDA by piping the group to the dining room. Master of Ceremonies for the evening and MICA Founding Chair Michael Ernst then welcomed everyone, led a toast to Canada and thanked the GDA committee for their commitment, their work and for doing such a fine job. Dr. Brom Hart, Co-Chair of the GDA Committee thanked his Co-Chair, Georg Ernst and the committee for a tremendous job. Michael then surprised the crowd with an award to a GDA donor that had supported this event since the original 13 years ago. He presented the 'GDA Dedicated Donor Award' to MICA supporter Gary Longard. from MC and MICA Founding Chair Michael Ernst. Gary has provided MICA with an original whimsical wooden carving for every GDA. These carvings are very popular and always attract a lot of bidding at the live auctions. Thanks Gary. MICA Chair John Meisner then welcomed everyone including the VIP guests and personally thanked Brom and Georg and the GDA committee. He noted the importance of this fundraising event and commented that to date, MICA had raised over $1.2 million that has gone towards the partnered acquisitions of 15 islands or island properties. 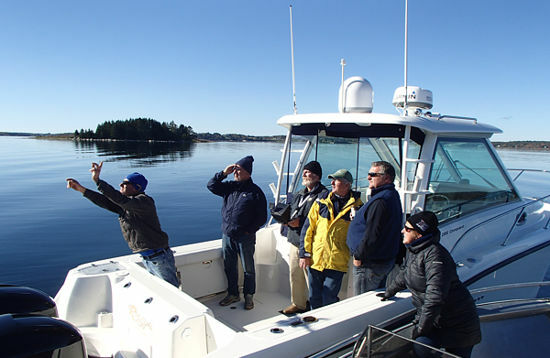 John noted that this year was another important year for MICA having acquired Squid Island in partnership with the Province of Nova Scotia and with support from the Municipality of the District of Chester. He also recognized Mr. John McLennan, in attendance, who most generously had donated Goat Island earlier this year. This year set another record for Corporate Supporters at 42. In his comments John noted the importance of this corporate support and recognized and thanked those companies stating that many had been supporting MICA since the Corporate Support program had begun. Please click on the image above to view MICA's Gems of the Bay video. During John's comments, a video was shown in the background with beautiful aerial photography of the some of our islands. This video was taken recently by drone owner and MICA supporter David Watson with editing by MICA supporter Wendy Levy. and Wendy Levy after the video drone was cleared for takeoff! 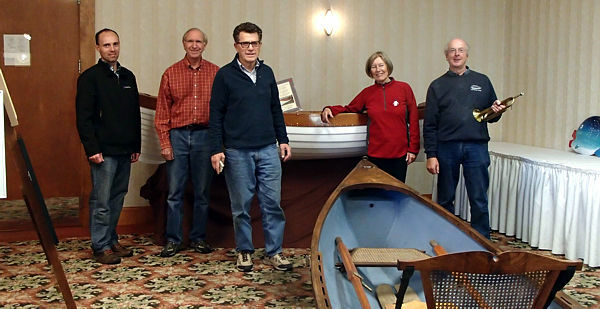 John also recognized and thanked The Indian Point Yacht Club (Mike Kelley, Pat Nelder and team), Innovative Planning (Wendy Levy) and the Mug and Anchor Pub (Fran O'Hagan) for working together to run last July 1 MICA Yacht Race and the evening MICA concert at the Mug and Anchor Pub. These events, which were to raise funds for MICA, netted our organization over $3000. John also thanked MICA partners; the Province of Nova Scotia, The Municipalities of the District and Lunenburg and Chester and the Town of Mahone Bay. In his closing comments he thanked the many people that have contributed to this event to make it so special, so important and so successful. An exceptional dinner was then served after which Michael, on behalf of all attending, thanked Chief Konrad for a job well done. In conclusion, MICA directors would like to thank all those who have worked so hard to have made this evening an outstanding success, to the artists and donors who have provided so many wonderful demonstrations of art and services, and to all who attended the 13th MICA GDA.